BROWN SPOTTED (CARRIES SOLID AND MARBLE). This is our our great big gentle giant, Lynx-Land Helios... all the way from the Czech Republic. I fell in love with this boy one night scrolling Facebook in a state of complete insomnia. I came across his picture on Iva's timeline and literally could not move past it. I contacted her immediately and Helios was here living with us a week later. He is seriously the whole package - a BIG package at that. Helios weighed well over 10 lbs at just 5 months of age and has continued to grow. Gorgeous wild look to him from head to tail, a pattern to die for and the best temperament you could ever ask for in an animal. Helios produces spotted, solid (melanistic) and marbled kittens for us when paired with specific queens. He has produced some amazing kittens here with us over the past few years. Thank you SO much for him Iva! 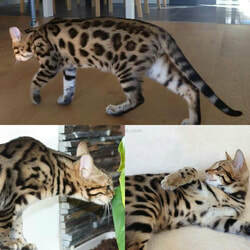 (Photos courtesy of Lynx-land Bengals). 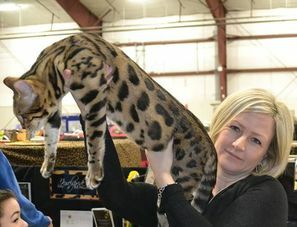 Right: Helios and I at the Can-Am cat show in Abbotsford, BC. Far Right: Helios, me and Anthony Hutcherson.